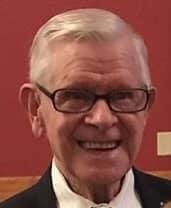 Lyle L. Fell,92, formerly of County Rd H Elkhorn, Wisconsin, died Wednesday, January 23rd, 2019 at The Gardens at Ridgestone in Elkhorn. He was born April 2nd, 1926 in Spring Prairie Township, Wisconsin, the son of the late Thomas and Hazel (Weber) Fell. Lyle was united in holy matrimony to Bea McDonald on December 24th,1948 in Lake Geneva, Wisconsin. They were blessed with 66 years of marriage. He served his country as a WWll veteran. He was an avid cribbage/euchre player, puzzler,and armchair wheel of fortune/jeopardy player. Lyle brought light into the lives of all around him with his humor, compassion, and kindness' Lyle was an active member of the Millard community covenant church of Elkhorn. At 90 years old, Lyle continued his love for baking by helping the church make pies for their 175th Anniversary. Lyle worked on the family dairy farm for 23 years. After retiring from farming, Lyle and Bea owned and operated the Blue overall tavern in Elkhorn, for 5 years. Together, Lyle and Bea cleaned for a local agency well into their 80's. Lyle found joy in frequenting auctions, tending his garden, and spending time with those he loved dearly. Lyle is survived by his 5 children Karen (Paul) Paladino of Elkhorn, Fae (Richard) Hill, of Janesville, Lyla (Jim Koeberl) Fell of Waunakee, Brian (Sharon) Fell of Grand prairie, Texas, and Barry (Rosalynn) Fell of Milwaukee; 15 grandchildren, 13 great-grandchildren, 4 great-great-grandchildren, sister Pat Quass of Elkhorn, and by a host of other relatives and friends. Lyle was preceded in death by his wife of 66 years, Bea, his parents, and 7 siblings. The family would like to send a heartfelt thank you to the staff at Ridgestone Terrace and The Gardens at Ridgestone for the excellent care and support they provided for Lyle and his family. Lyle felt at home with the love, compassion, and care that was given over the lasts 5 1/2 years. He was especially fond of their fantastic activity's coordinator Dawn Tatosian, whom Lyle cared deeply for and always managed to bring a smile to his face. To the Aurora at Home staff, thank you for the guidance and support you provided in caring for Lyle during his last few weeks of life. Our sincerest gratitude to Tim Lockwood & Kate at Haase-Lockwood Funeral Home. Please join us Saturday, February 16th, 2019, for a Celebration of Lyle's Life at 1PM. lt will be held at: Millard Community Covenant Church N6713 Co Hwy O Elkhorn, Wl 53121. On-line guestbook is at www.haaselockwoodfhs.com. Arrangements completed by Haase-Lockwood & Associates Funeral Homes and Crematory of Elkhorn, Wl.